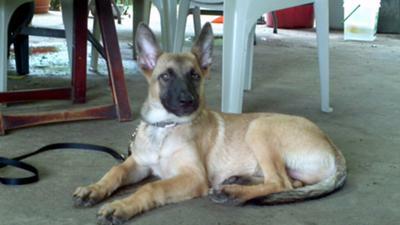 Rockey is a Belgian Malinois Shepherd. He is 13 weeks young at 30.6 pnds. and 17 1/2 in. tall. 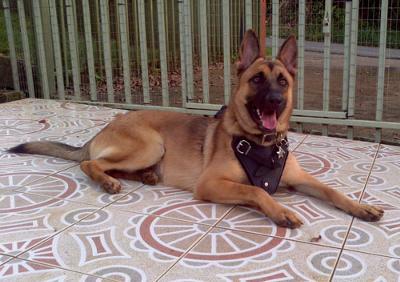 He is one session short of completing obedience and protection training. He will be allowed to grow until 7 mo. to begin formal protection training. His trainer said Rockey is right on schedule, completed training, and have still to grow his permanent teeth. Good luck to everyone with their pups. Rockey is now 22 weeks young at 50 pounds and 22 1/2 inches tall. 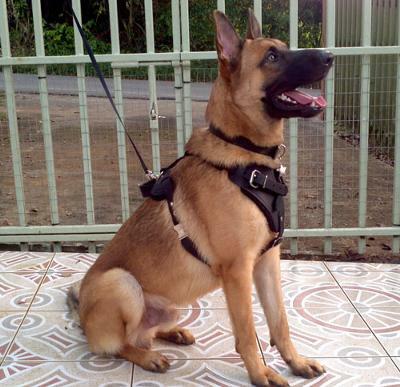 He continue waiting for his 8 month birthday to begin his 2nd phase of obedience /protection training. Thus far he has been doing fine and adjusting to his now new set of permanent teeth. He is very alert in protecting his home and pack family members. 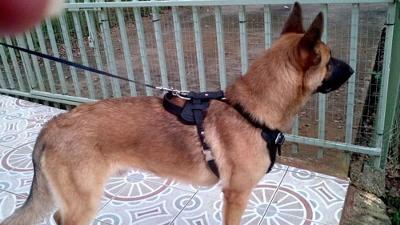 Rockey at 32 weeks in his new agitation/protection training harness.